Your Employee Manual will communicate to your staff exactly what “the rules” are for working at your company. It defines the codes of conduct you expect and keeps your company in harmony. When everyone clearly knows the rules, employee hassles and conflicts are reduced significantly. Your Employee Manual will communicate to your staff exactly what “the rules” are for working at your company. It defines the codes of conduct you expect and keeps your company in harmony. When everyone clearly knows the rules, employee hassles and conflicts are reduced significantly. It can easily be amended to fit your company’s way of doing things. 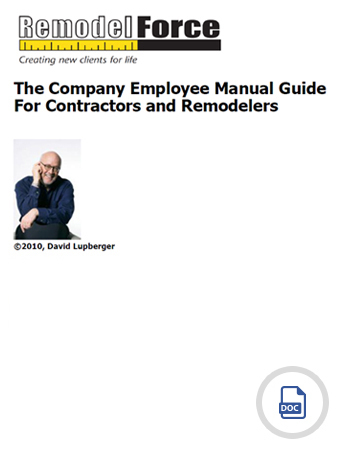 Over 50 policies are included in this manual – everything from employee absences, to sick call-in, workers’ compensation, bonuses, moonlighting, use of company equipment, behavior in client’s home, vehicle appearance, safety practices, and more.